This is a 3h improvers’ workshop for those with already a little experience in the dance style (see the beginners’ workshop a week before! -> https://www.facebook.com/events/733598423688929/). We’ll dive deeper into this dance style to help you build a sounder technique, better partner connection, and a richer vocabulary for you to throw out on all those hot, swingin’ dance floors! The workshop will be taught in English (unless all participants speak fluent Finnish). 9.2.2019 Lindy hop Improvers’ workshop – Swing Out! This is a beginners-intermediate intensive course for those with some Lindy hop experience. You should have participated at least in one Lindy hop workshop/course covering the very basics of the dance before attending this one. The topic of this workshop is the coolest dance move of them all: the Swing out. This is the iconic dance of the early jazz era of the 1920’s. Flappers, speak-easies, drop-waisted fringed dresses, and lots of kicks! Once considered scandalously uninhibited, it is energetic and wild in nature, where faster movements are often contrasted with slower, dragging steps and improvisations and musical expression to 1920’s style jazz music. This 3h beginners’ workshop will have you twisting and kicking, covering basics of movement and technique and a whole bunch of classical moves and elements to take with you and throw out on the social dance floors and the Speakeasy joints. Welcome to weekly partnered Blues dance classes with a role switching opportunity in spring 2019! During this course we will mostly concentrate in blues dance technique (quality of movement, partnering), but also widen your dance vocabulary and general knowledge about blues dancing. The course is intended for dancers with 1+ years of experience in Blues dancing. 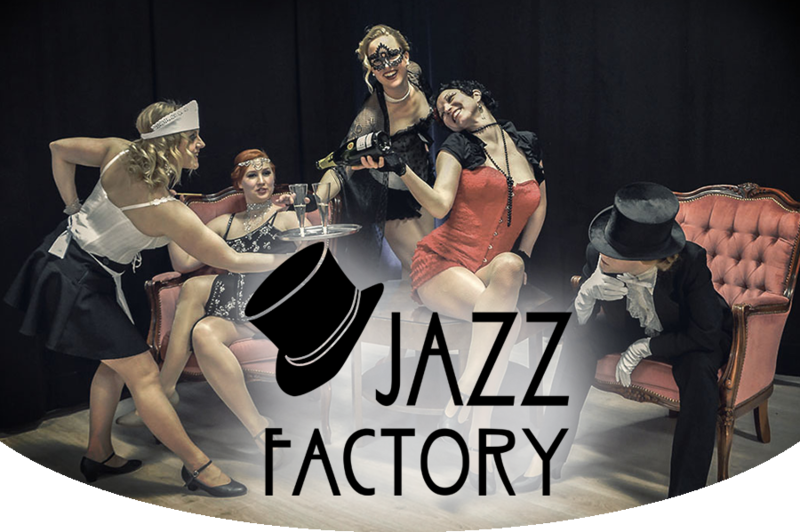 In case you’re not sure whether the course is for you, please don’t hesitate to ask by sending an e-mail describing your (blues) dance experience to info@jazzfactory.fi. This is a one semester-long course of 12 times. Classes (1h15min) are held on every Thursday evening at 19.00-20.15 (+ social dance 15min) starting 24.1.2019 and ending 2.5.2019 (exceptions: no class on 21.2. + 28.3. + 18.4.). WHAT IS ROLE SWITCHING AND WHY DO WE DO IT? All participants will have a chance to practice the same techniques both leading and following. During the classes we will take turns in changing partners and changing roles. This has proven to be a very good learning method and our students have loved it! It doesn’t just make you a more comprehensive dancer, but also teaches you a lot about dancing in your preferred role. P.S. We still accept a fairly equal number of “default/preferred” leaders and followers to the classes in order to make sure everyone has a chance to practice also with dancers who are dancing in their preferred role. In spring 2019 our beginners’ level blues dance classes (0-1 years of experience) come in three parts – three independent crash courses of which you can choose one, two, or all three. The themes and topics covered in the courses are different and independent of each other, but also complementary to each other and accommodating to your introduction to the dance and to your learning process. Each course part consists of 4 x 1h15min. More detailed course descriptions in separate facebook events coming up soon. 55€ per course (students 50€) / 150€ if you register to all three parts at once (students 135€). The Shim Sham is originally a tap dance routine – regarded as tap dance’s national anthem – but has taken soft shoe forms as well, one of which has become the one universally known routine in the swing scene globally. The soft shoe Shim Sham is must in a swing dancer’s vocabulary. Learn it in a 2,5h workshop at the Jazz Factory. Welcome! If you want to learn just one partnered jazz dance, learn this one. Versatile enough to go from slow and classy to the fastest wildest tempos, Lindy hop is the wild partnered dance craze of the 1930’s. Revived in the last decades, Lindy hop incorporates jazz steps, Charleston, and the world’s best dance step: the ‘swing-out. Though famed for its big showy performance ‘aerial’ moves, where one partner throws the other, for the most part it is a ‘social’ dance, and an unusually collaborative one, with lead and follow, in which both partners can contribute a lot to what happens. In this beginners’ workshop you will learn the Lindy hop from scratch. We will cover the basics or movement, technique, learn the most crucial tools and a few classical moves that will get you on your Lindy path. -> You fill find your own level during the audition class on 18.1. Returning students can choose to stay on the same level, but are requested to join the audition nonetheless. –> Please note the absolute BEGINNERS’ WORKSHOP on 30.8. This is warmly recommended for those planning to join the weekly classes for the first time, as other dancers on level one might already have previous Blues dance experience. This is a follow-up course to both the Lindy hop Beginners’ intensive course and Lindy hop Beginners’ workshop held in May-June this year. We will recap the material of the past courses and build up on it, covering new topics such as 6 count vs.8 count and kick steps. The workshop will be taught in English (unless all participants speak fluent Finnish). This is an introductory course to the basics of partnered Blues dance, touching on issues such as the pulse, some basic moves, and partnered connection and the history of Blues dancing. This 3,5h beginners’ workshop will have you twisting and kicking, covering basics of movement and technique and a whole bunch of classical moves and elements to take with you and throw out on the social dance floors and the Speakeasy joints. The workshop will be taught in English (unless all paricipants speak fluent Finnish). The Tranky Doo routine is a well known jazz choreography (by Pepsi Bethel) seen danced by the infamous Al Minns and Leon James in the dance documentary ‘The Spirit Moves’. Like with the Shim Sham and the Big Apple routine, if the song most often used for the Tranky Doo is played at a Swing dance event it often draws the dancers to the floor to dance it together. A must, therefore, in a swing dancer’s vocabulary. In this intensive course you will learn the Lindy hop from scratch. We will cover the basics or movement, technique, and learn the most crucial tools and a variety of classical moves that will have you well on your way into the world of swing dance. In this 2h workshop you will learn the Sandra’s stroll – a nowadays known solo blues (with known jazz steps) routine danced to Duke Ellington’s The Mooche. The routine is choreographed by Sharon Davis (2006) as a tribute to Sandra “Boogie” Gibson, inspired by the footage of her dancing in the famous documentary The Spirit Moves. Charleston! That iconic dance of the early jazz era of the 1920’s: flappers, speak-easies, drop-waisted fringed dresses, and lots of kicks! Once considered scandalously uninhibited, it is energetic and wild in nature, where faster movements are often contrasted with slower, dragging steps and improvisations and musical expression to 1920’s style jazz music. This nearly 3h beginners’ workshop will get you started on your own path as charleston dancer, covering basics of movement and technique and a whole bunch of classical moves and elements to take with you. Learn the Shim Sham routine Al & Leon style! The Shim Sham is originally a tap dance routine that has taken many soft shoe forms. The one for this 3,5h workshop is by the famous jazz dancers of the 1940’s, Al Minns & Leon James. This workshop requires no previous knowledge of the other Shim Sham variatons. The term authentic jazz (Vernacular Jazz/Jazz Roots/30’s-40’s Solo Charleston) covers all the steps unique to the 1930’s and 1940’s jazz-era repertoire. This dance is danced solo and improvised with basic step variations and musical self-expression to 1930’s and 1940’s style jazz & swing music. This nearly 3h beginners’ workshop will get you started on your own path as jazz roots dancer, covering basics of movement and technique and a whole bunch of classical moves and elements to take with you. PS. Shim Sham workshops are organised 3-6 times a year by the Jazz Factory. If this one had an inconvenient timing, stay tuned for the next ones. -> You fill find your own level during the audition class on 7.9. Returning level 2 students can choose to stay on the same level, but as requested to join the audition nonetheless. For those who are considering taking the weekly classes and want to check it out first 😉 -> The weekly classes are held on Thursday evenings, starting 7.9. and ending by 7.12. There are two levels (beginners/improvers & improvers/intermediate) for which the audition is held on the first day. Using simple concepts from the Alexander Technique and Wutao Breathwork, you will have the opportunity to heighten your movement awareness and bring more sensation, flow and pleasure into your dance. The fluid rolling motion of the pelvis that waves through the spine, is at the core of Blues movement. This is what makes it flow, what makes it fun and sensual, what makes it groove. In this workshop we will use the breath to fluidify this wave and gain access to a wide range of Blues movement and partner connection. We will work both solo and in pairs, using this heightened sense of the breath and movement to clarify and expand your own Blues reporitoir and to bring connection and spontaneity into your partner dancing. This is an open level workshop (beginners-advanced). If this is your first workshop with Peter Sweet, this is a great chance to dive in and experience his unique approach to the Blues. For return students Breathing the Blues is a perfect follow-up to apply the tools you have learned to enrich your Blues movement vocabulary. Peter Sweet (San Francisco/Berlin) first learned to dance by jumping from rock to rock in the river as a young boy. Since then he has had many years of professional training, but has always held on to this playful spontaneous approach to movement in his dancing and teaching. Sweet is a certified teacher of the Alexander Technique and has been fascinated with the beauty and subtlety of partner work since he began studying tai chi push hands in 1999. As a drummer and a life long lover of jazz, blues and latin music it was inevitable that he would end up dancing his way around the world. Sweet has spent more than 9 years in full time movement training as part of his work as a professional circus, dance and theater performer. Along with his 3 year education in Alexander Technique, he attended dance conservatory at the Salzburg Experimental Academy of Dance (SEAD), studied movement based theater at the Helikos School for theater creation and is an instructor of the Wutao Breath and movement system. Peter has taught his own signature workshops, combining Alexander Technique with dance, Wutao and physical theater, at the DOCH University of Dance and Circus in Stockholm Sweden, the musical theater department of the Bayern Theater Academy in Munich Germany, the Jazz Factory in Helsinki, Finland and many many more. The simple act of breathing fully while you dance is a powerfully effective way to bring lightness, spontaneity and fun to your experience on the dance floor. Using tools from the Alexander Technique and Wutao breath-work, we will increase your sensitivity to the flow and movement of your own breathing. This awareness will help you to feel your partner more clearly, and dramatically increase your ability to both follow and lead. Your breath is a tremendous asset to you. With a bit of attention you can learn to use it to bring rhythmic variation, dynamics and enjoyment into your dancing, while at the same time increasing your connection to your partner and the music. There is a strong push in our culture be superhuman and to view our body’s sensations and needs as a hinderance. This class is an opportunity to shut out all that noise. Dance is a fundamental human act. Just like speaking, moving or thinking, it is based on breath. Stop breathing and you die! So before that happens, lets breathe together ..and dance! You can also book private classes from Peter Sweet. Starting January 2017 the Jazz Factory will offer two levels of partnered Blues classes, rewarded with some social dance time (social practicum) after each class. Laura Halttunen & Arja Sahlberg. Join this long-requested beginners’ workshop to learn Collegiate Shag! Collegiate Shag is a swing dance that originated in the United States during the 1920s and 1930s. Some of the most influential Shag dancers of that period were Arthur Murray and Ray Hirsch. Collegiate Shag is particularly known for its fast paced, extroverted and fun character. This workshop is divided into two parts. For the first part, no prior Shag experience is needed – it’s for everyone who wishes to learn how to dance Shag or practice the basic steps, some useful footwork variations and nice figures. In the second part we will add some more fancy footwork to our vocabulary, learn a couple of flashy moves and breaks and crank up the speed of the music little by little with the aim that at the end everyone will feel confident to dance any time a “shag-able” song comes on during a swing dance social. Judith Valerie Engel is a pianist from Vienna. She is currently doing an exchange semester at the Sibelius Academy. In addition to her musical profession she has been dancing all her life: She started taking classical ballet classes at the age of 6 until she was 11. After that she spent a few years focusing mainly on ballroom dancing. In addition to that she trained Brazilian Samba for a year and sought to become a more versatile dancer by participating in various workshops and classes in a variety of dance styles from Oriental to Hip Hop. For the past few years her focus has been on Swing Dance. She started out with Lindy Hop but soon discovered her passion for Collegiate Shag which she wishes to share with as many others as possible. Peter Sweet returns to Finland to present the second eddition of this unique workshop on the magic of bringing breath into your micro blues. We will review and enrich the fundamentals (newcomers welcome) and go on to apply them to more aspects of your dance, including further work on musicality, fluid isolations of the spine and individual Alexander-based coaching on alignment. Get your spot early as they are limited! The magic of Micro blues is that with fine movements in a tiny space, you can dance a dance that is every bit as rich and varied as a full strut through the ballroom. It’s like having a beautiful conversation that only you and your partner can hear. Using simple tools from the Alexander Technique, we will work to increase your sensitivity to the ever present movements of your own breath and balance. With this awareness you will make contact with your partner. Once you begin to feel the basic rhythm of your partners breath and balance, then the slightest movement in either lead or follow will send ripples through both. This is micro blues. Once we arrive at this baseline of connection and listening, then we will explore how to be just as sensitive to the detailed movements of the music. At this point the “little” dance becomes an infinite playground of possibilities. Micro blues can be slow or fast, high or low, sensual, playful and totally surprising. There is a whole universe in this dance once we learn to listen. Saturday: Blues dance party 21.00-02.00 -stay tuned for more on this! A two hour, all levels course covering the essentials of Peter Sweet’s unique approach to Micro blues. Include in your email the name of workshop, your name, your preferred role (leader/follower) and a few words on your blues dance experience. One Step, Peabody, manouvering and some slick turns too. Footwork variations for different moves. Good for leads and follows. Join our Blues 2 workshop on Friday! MONDAY 12.9. & TUESDAY 13.9. Option for private classes with Chris Härm. Following up on the success of last year’s workshops, Nikolas Lloyd returns from Great Britain to teach two workshops in Lindy hop. A familiar figure at the Herräng Dance Camp, where he has been something of fixture since 1999, he has been teaching Lindy students for nearly twenty years. Expect him to push you towards the limits of your Lindy ability, and to use some obscure English words (which will be explained upon request).Three hours of teaching, suitable for those with a solid core of moves, reliable connection, and the ability to keep things going that comes with experience (18months +). This workshop will include some challenging Charleston variations, some moves to test the quality of your ‘frame’, and will put emphasis on musicality. Ballroom Blues is a newer style of Blues dancing. It’s an intriguing combination of the draggy bluesy feeling, classy ballroom style and some show elements. This is a soft landing to Blues for any ballroom dancer (or lavatanssija), and a new perspective for those more experienced in the authentic Blues styles. This workshop is open level: for beginners and improvers alike. Fast blues is an essential part of blues dancing. It’s rhythmical, and playful, and after learning about the techniques and steps – it’s loads of fun! After this workshop you will know what to do when the mellow blues is spiced up with some fast Chicago or Delta Blues tunes, which often happenes in events with live blues. Learn the basics of lindy hop in an 8h workshop (4x 2h)! Two inspiring and fun teachers are there to make sure you improve fast. The group will be a small one (max 7 couples), allowing the possibility for a lot of personal attention and feedback. Absolute beginners and beginners in lindy hop. Dive into micro blues and understand more in depth the ways in which to use breath and movement in your dancing. One of the specialisations of this masterful acrobat is how to draw from the Alexander Technique to develop clarity and awareness for the smallest movements of your partnered blues dance, opening up a whole new world of possibilities. You! Anyone, from beginners to advanced. Social Dance 21.00 – ? This workshop will introduce to you the wild partner charleston dance of the 1920’s glamorous jazz era. During these two hours you will learn the basics of this fun dance as well as some crazy moves you can show off on the dance floors of any Speak Easy joint in town! The Shim Sham is originally a tap dance routine – regarded as tap dance’s national anthem – but has taken soft shoe forms as well, one of which (made my Frankie Manning) has become the one universally known routine in the swing scene globally. The soft shoe Shim Sham is must in a swing dancer’s vocabulary. Learn it in a 2h workshop at the Jazz Factory! Welcome! – A dance class for mothers/fathers and their small babies! The classes consist of warms ups, choreographies, and muscle workouts. You can participate without previous experience. Also toddlers are welcome! Take with you your own matt and baby sling. Every Tuesday at 10.00-11.00, starting 19.1.2016. The Tap Club is a series of workshop held at Jazz Factory during the spring, and the sessions include technique, rhythms, dance routines, and improvisation. Every time Säde brings in new practices and routines, and theses can be filmed in order to continue one’s practice at home. The Tap Club consists of 3 x 2h workshops that are held once a month. You can register either for certain workshops (normal price), or for all the workshops (with a discount). This workshop series is meant for anyone with a little experience in tap dance (or at least fast learning skills). Tap shoes are useful, but not necessary. Säde is a dancer, choreographer, Pilates and dance teacher. She has graduated as a dance teacher from Savonia AMK (2004) and as a Master of dance art from Teatterikorkeakoulu (2013). She works full time with dance and pilates in dance schools, theatres, groups and productions, the latest of which were by Helsingin Tanssiopisto, Helsingin Kaupunginteatteri and Pilates Helsinki. Säde has travelled the world at international tap courses and festivals. She has performed tap e.g. in the great musical Mary Poppins at Helsinki City Theater, in cabarets at Studio Hop Summer Camp in France and the Stockholm Tap Festival, as well as as a solo act of the Sinfonia Lahti at the Sibelius concert hall. Säde is an experienced, inspiring and professional teacher. She gets her kicks from rhythms, rough jazz, and those quality sounds of tap shoes. Nikolas Lloyd from Newcastle, England will deliver his second Lindy Hop workshop for those who want challenge, dealing with the subtelties of lead and follow and footwork variations. Mr. Lloyd is well-known in the Herräng scene, and brings us not just novel moves, but a fresh perspective and his rather British wit. Have you already done at least one semester in the intermediate level (see eg. levels of Rock’n’Roll Dance Club Comets ry)? Or are you already at the advanced level? Then this workshop is made for you!